Jar fragment depicting Egyptian god Bes is first discovery of such vessel in Judean highlands. 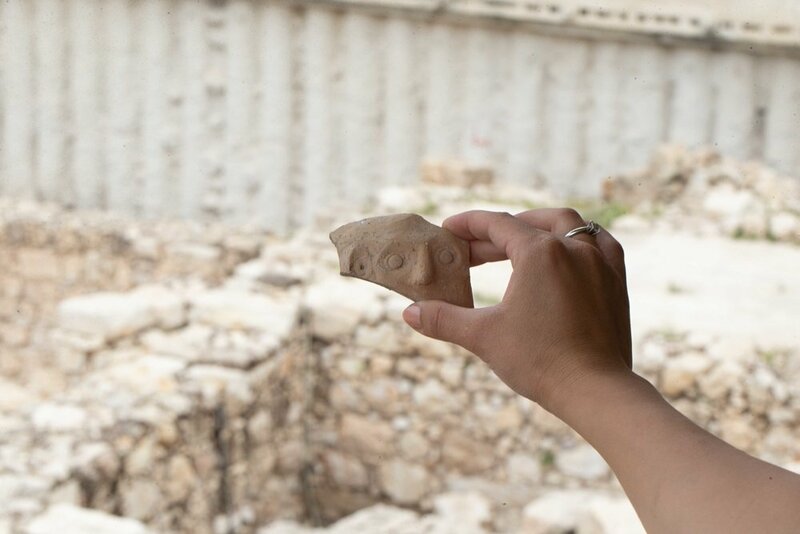 Once again, the Givati Parking Lot excavation in Jerusalem has yielded an exciting and significant artifact. In a large refuse pit filled with potsherds dating to the Persian period (4th – 5th century BCE), archaeologists found one sherd staring back at them - quite literally! The sherd depicts a human face, and is decorated with large, almost bulging eyes. The startling discovery grew more intriguing as the archaeologists recognized whose face it was looking back at them. The sherd’s features are characteristic of the Egyptian god Bes, usually depicted with a large face and eyes, his tongue sticking out and wearing a feathered hat. While only part of the dwarf-god’s face is preserved on the sherd, it is doubtless part of a “Bes-vessel” which were common during the Persian period. According to the Israel Antiquities Authority’s (IAA) press release, Bes was a protector deity of households, particularly of mothers, women in childbirth and children. Over time he was regarded more broadly as the defender of everything good and was associated also with music and dancing. Bes’ image is frequently found adorning household walls and objects such as mirrors or, as in this case, sculpted into pottery vessels. Bes was also worn on amulets as a talisman for good luck and protection. Presumably, his humorous features were meant to evoke joy and frighten off evil spirits. So what was Bes doing in Jerusalem? The Givati Parking Lot excavations are a joint project between Tel Aviv University and the IAA. Prof. Yuval Gadot of Tel Aviv University and Dr. Yiftah Shalev of the IAA say that “this is the first time that such a vessel has been found in archaeological excavations in Jerusalem or anywhere in the Judean highlands.” During the Persian period, images of Bes are quite common outside of Egypt. Numerous Bes-vessels and amulets have been discovered in Persian period settlements along Israel’s coast, indicating that the Phoenicians adopted him as a protector god. Farther north in Persian cities such as Shushan and Persepolis Bes also makes an appearance. Presumably, Bes was brought to Persia by Egyptian craftsmen who worked there as a result of the period’s International trade economy.